Last edited by GTO : 13th March 2013 at 11:30. Last edited by GTO : 13th March 2013 at 11:29. As petrol-heads, we love our cars and like to pamper them. The marketing spiel would have us believe that decarb is indeed a magic solution that'll make our engines run smoother, faster and more efficiently. Personally, I think it’s all rubbish. Shom, do you also suppose there is the possibility of leaks on an old engine (similar reason to why engine flushing isn’t recommended for 6-digit motors)? I’m wary of feeding my engine with suspect, untested and uncertified chemicals. Why fix something that isn’t broken? I’ve owned several engines that have run well over 150,000 kms, delivering optimum levels of performance and efficiency (WITHOUT decarbonisation). I'm hopeful your write-up prevents folk from getting fleeced; have seen service advisors convince owners of 20,000 km hatchbacks into decarbonisation! As you rightly stated, perfectly timed maintenance (oil changes, good oil) are far more important. Case in point : The Vtec producing each and every one of its horses at the 7 year mark. Main reason = Mobil 1 + regular oil changes (link to full thread). Last edited by GTO : 13th March 2013 at 11:48. There are no scientific evidence-based studies that attest the effectiveness of these proprietary machines and chemicals. Thanks for an excellent overview. I agree with the various considerations you list. Interestingly enough, my Jaguar dealer in Kansas City used to promote a fuel additive. Cant remember what is was, but it was supposed to do the usual, reduce carbon build up, keep injectors clean etc. etc. Never believed them. Only once did I have an engine decarbonised. Many years ago I owned a Volvo 340DL. This was a carburator engine, no catalytic convertor. It kept suffering from pre-ignition and knocking. The Volvo dealer brought in an expert and even he couldn't fix it. But he ultemately suggested decarbonizing. They added something to the fuel and left the car running for 30-60 minutes or so, maybe we even drove a bit, cant remember. By that time the engine was definitely running very differently. 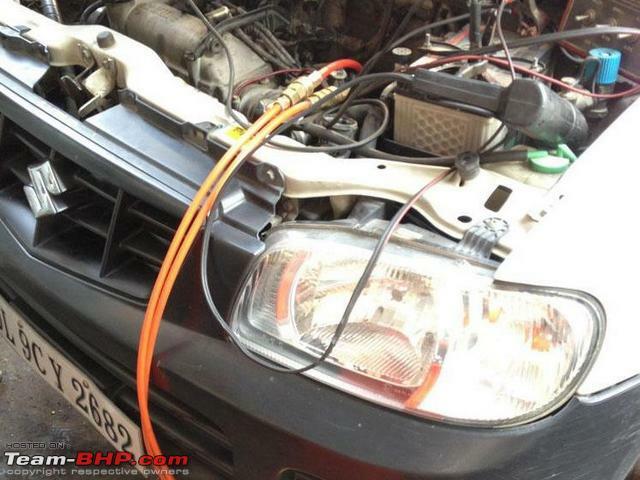 Volvo than managed to adjust and tune the engine properly and the problems never returned. So very likely that the knocking was being caused by considerable carbon built up in the cilinder and cilender head. Somehow this treatment managed to get rid of sufficient quantity, so the engine could be returned to normal. Again, this was probably more than 30 years ago. These days with modern diesel/petrol cars its hardly a problem. ...do you also suppose there is the possibility of leaks on an old engine (similar reason to why engine flushing isn’t recommended for 6-digit motors)? That decarbonising can cause a slight loss of power or increased oil consumption is well-documented for older engines. This is usually attributed to the breaking down of the oil seal between piston edge and cylinder bore, by the removal of the ring of carbon that had formed on the piston edge. However, in time a new oil-seal may form and the compression would therefore improve. New generation engines (e.g. BS-III, BS-IV) do not form so much carbon during combustion. Removing whatever little has formed to compensate for cylinder bore wear, MAY leave you with leaky pistons after decarbonising. Flushing can cause oil seals in the lower half of the engine (such as big-end bearing seal) to leak - decarbonising can do the same to the fuel pump. ...Volvo 340DL...kept suffering from pre-ignition and knocking...ultemately suggested decarbonizing. I don't suppose you tried an Italian tune-up before that, did you? Last edited by SS-Traveller : 13th March 2013 at 12:34. Super write-up SS Traveller. This is a very informative article. I only wish I had read something like this some 4 years back when I was conned into doing engine decarbonisation for my swift diesel which had run only 26,000 kms . Hopefully, this prevents others from getting these done. Although on modern cars driving them very gently and at low rpm isn't a big thing, its also a myth that reving (under load) and generally giving it the beans is bad for your engine. It is not. Car engines are designed to work well with little wear and tear across a wide range of performance, rpm and loading. Still, rule of thumb is that from a wear and tear point of view car engines do best at around 60 - 80% of maximum power ratings. On a slighly lighter note: When I was in the merchant navy I spent many years on ocean going tugs and supply and anchor handling vessels. It meant often going along side an oil rig for extended periods of time. For safery reasons we always kept all engines going. But that could mean we had two main diesels of say 6-8000HP each, running at idle for 24-48 hours at a stretch. By the time, we did cast of and run up to full power you would not believe the amount of smoke and dirt that came out of our smoke stacks! Whole placks of soot and dirt were spewed out for minutes. Also, on merchant ships there is a preventive maintenance activity called washing or flushing the turbo's. On the exhaust turbine, there is carbon built up, because there is obviously carbon particles in the exhaust gas. Large turbo have a washing/spray system. The engine load is run at roughly medium rpm or loading and then water is sprayed into the exhaust turbine. The water droplets are extremely fine. It's really the mechanical impact of the water droplets hitting the carbon built up and knocking it off. No need to do so on your little car diesel. If anything, please do not spray water into the turbo! Italian tuners, eat your heart out! 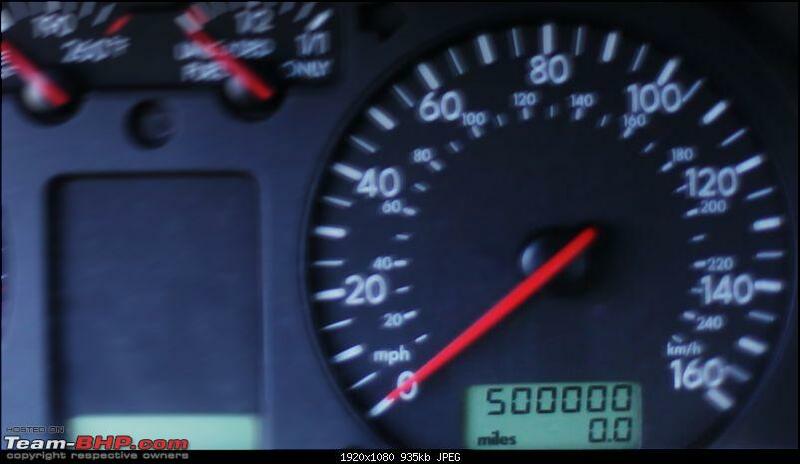 A guy in America has a 1.8T engine'd Jetta which has clocked up 500k miles (804672 kms). Even more impressive is the lack of wear in the engine. All the components were still in factory specification. His explanation - Use of synthetic oil, use of fuel system cleaner every 10000 miles and platinum spark plugs. The question now was, how the hell did I get there? Back to the autopsy! Dale had removed the engine/heart from the patient, and it was time to peer inside. This is what we saw underneath the valve cover—or rather what we didn’t see: sludge, a byproduct of oil breaking down and the archenemy of every engine. Not only was everything exceedingly clean, but there was also minimal wear, including on the camshaft lobes whose job it is to open and close the intake and exhaust valves. “The lobes are showing hardly any wear,” said Dale. “See how nice and pointed they are?” His explanation: I used synthetic oil, and changed it every 5,000 to 7,000 miles. And while you can’t see it here, this is also the reason why the cylinder walls were so smooth, exhibiting little evidence of wear, despite 500,000 miles of piston friction. “You can still see the cross-hatching!” said Dale, pointing to machining marks inside the cylinders, which would normally be worn invisible by this point. And the pistons themselves? Astonishingly little wear. The geeky pride I felt was obvious to anyone who looked at my face. Next Dale rotated the engine so we could check the other side. Postscript: I sold the body of the Jetta to Rob Delaney, who will use many of its parts to fix up other Jettas for people who need a set of wheels. This felt right. 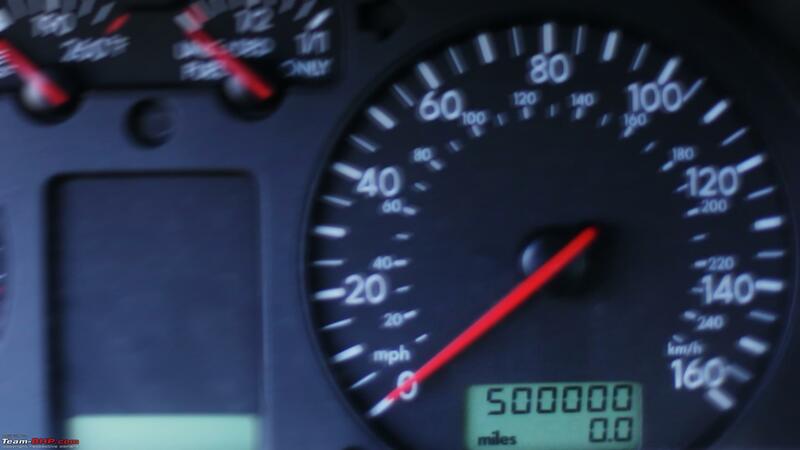 The Jetta may have stopped racking up miles at 500,000, but now I know it will continue to live on. Last edited by dkaile : 13th March 2013 at 13:46. How about Engine Flushes? They are known to clean out your engine of carbon deposits without a lot of expense- Cyclo, Abro, Xado etc are available in 400-500 range. The issue was with the timing chain guides which were damaged accidently and the original ones were not available for replacement. So that meant frequent removal of engine head to install handmade prototypes made out of teflon. When i dismantled the engine for the first time, i spent a good time scraping off the carbon deposits on the piston crown. but whenever i dismantled the head after that, be it a week or even 10 minutes after running the engine, they were back. scrubbed them off again for a few times, but stopped bothering when i realized that they are destined to be there . The engine was in a good state of tune and the plugs were a beautiful brown color indicating a good mixture. AFAIK, they wont help with carbon deposits in the combustion chamber, intake and exhaust system. Last edited by moralfibre : 14th March 2013 at 07:38. Reason: Back to back posts. Please use EDIT / Multi-quote. Thanks for the great article SS-Traveller! Each time I visit the service station for my periodic servicing the fellow keeps on insisting that I get an engine flush and Engine de-carb done. My Ritz has done only 30,000 kms! I went through the whole service manual and did not find a word about this. Thanks to your article now I know what exactly happens and would personally never get it done. I was thinking of driving down to NCR for a Decarb job. Now i realized its not necessary,my car is running fine with a dosage of Delvac1 every 8K kms,and its primarily used on highways,so no chance of clogged internals. Post deleted by the Team-BHP Support : Please do NOT post one-liners that add little or no informational value to the thread. We need your co-operation to maintain the overall quality of this forum. Please read our rules before proceeding any further. Last edited by GTO : 14th March 2013 at 13:48.